So, here we are in Cornwall and the rain has finally stopped. Apparently it’s back with a vengeance tomorrow, so let’s enjoy this moment. Once again, we’re very lucky to be staying at a friends’ smallholding near a village called Praze-an-Beeble. Literally translated from Cornish this means “meadow with a culvert in it”, which sounds a bit banal so I’ll stick with the Cornish name if it’s all the same. This was once serious tin mining country, not a place for the faint hearted, and the chimneys of two engine houses still mark the top of the lane leading to the small group of dwellings which make up Trevoole. Trevoole Farm is a very special place. The main house, cottage and its outbuildings have been lovingly restored by Beth and Travis over a number of years. The magnitude of this task is easily forgotten, as the whole place appears so rooted and permanent in its setting. The sense of genuine antiquity is enhanced by Beth’s eye for detail in all things. 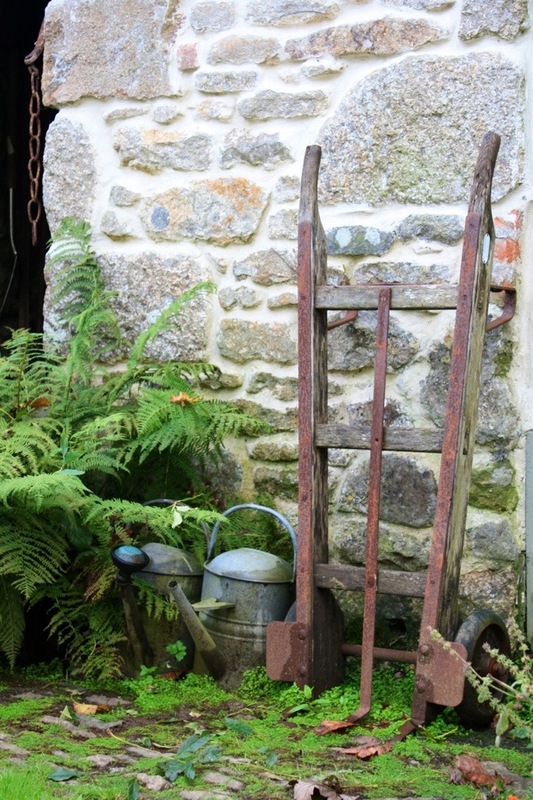 Rusting sack barrows and tools rest against the thick granite walls, laundry rooms are stacked with vintage fabrics and shelves are lined with old, carefully selected books. It all looks effortless but is the result of much time, care and love. 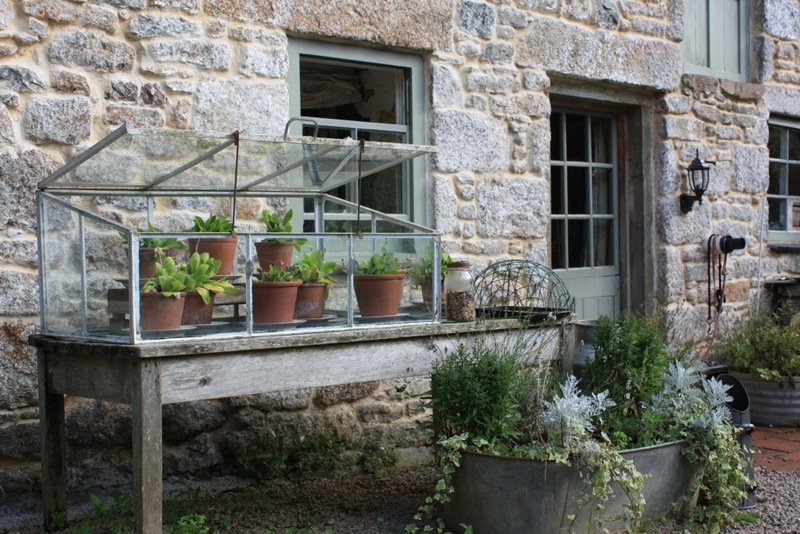 The garden achieves a perfect balance between practical and functional. Chickens, ducks and geese scratch around under the rose walk and pigs rootle about in the glorious mud next to a very pretty bog garden. 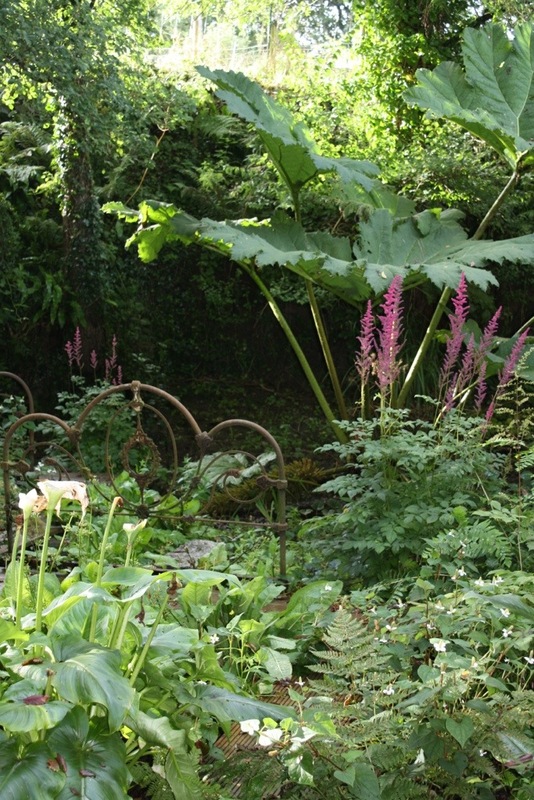 Here, Zantedeschia, Gunnera, tall pink Astilbe, Houttuynia cordata and primulas romp around happily in the shade, taking little notice of the vintage bedstead in their midst! Elsewhere in the garden other features like this appear to lift an everyday scene out of the ordinary. Even a rusting Morris Minor in the orchard seems strangely appropriate. The gardens are open for the National Garden Scheme in early May and again later in June and are very popular with visitors. At this time of the year, colourful hydrangeas line the drive and the fruit in the trees is ripe as we head towards autumn. Somehow this seems to complement the antiquity and mellowness of the place all the more. Here the granite is less grey than elsewhere in Cornwall and the walls of the buildings give off a lovely warm glow. 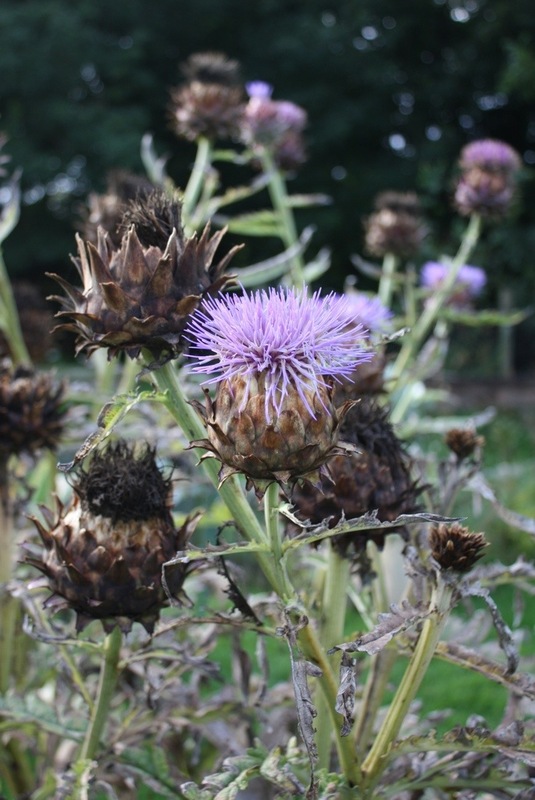 Above, the last of the artichokes puts on a sparky display in the Patchwork Potager. 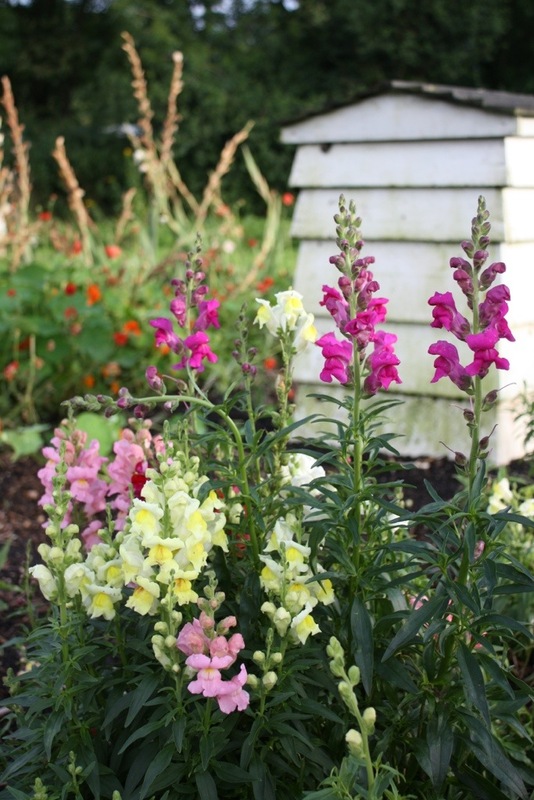 In the same part of the garden a group of colourful Antirrhinums continues the party in front of one of the beehives. And, nearby, a packet of seeds which cost just £1 brings life and colour to a quiet corner of the garden. 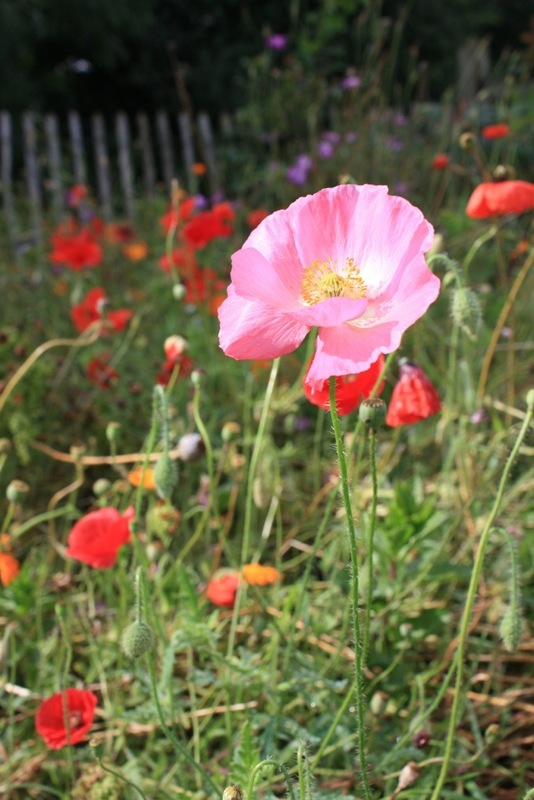 It took me a long time to take this picture because the poppies would not stay still in the breeze! For us urbanites, Trevoole is the perfect escape, a place where we don’t even have to try to unwind. For Beth and Travis it’s their home, and we are very fortunate they choose to let us share it with them.